Everyone was buzzing about the shocking, bombshell new report by The Atlantic yesterday, which revealed that Donald Trump Jr. and the WikiLeaks Twitter account had engaged in a “largely one-sided” conversation in private messages over the course of several months. 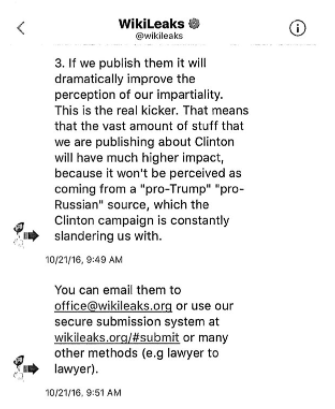 The author of the Atlantic article, Julia Ioffe, put a period rather than a comma at the end of the text about not wanting to appear pro-Trump or pro-Russia, and completely omitted WikiLeaks’ statement following the comma that it considers those allegations slanderous. This completely changes the way the interaction is perceived. There is a big difference between “because it won’t be perceived as coming from a ‘pro-Trump’ ‘pro-Russia’ source” and “because it won’t be perceived as coming from a ‘pro-Trump’ ‘pro-Russia’ source, which the Clinton campaign is constantly slandering us with.” Those are not the same sentence. At all. Different meanings, different implications. One makes WikiLeaks look like it’s trying to hide a pro-Trump, pro-Russian agenda from the public, and the other conveys the exact opposite impression as WikiLeaks actively works to obtain Donald Trump’s tax returns. This is a big deal. At first I wasn’t sure who was responsible for this highly egregious omission. It could have been Ioffe, an editor, the source of the leaked DMs or an intermediary deliverer who cut out the rest of the sentence. 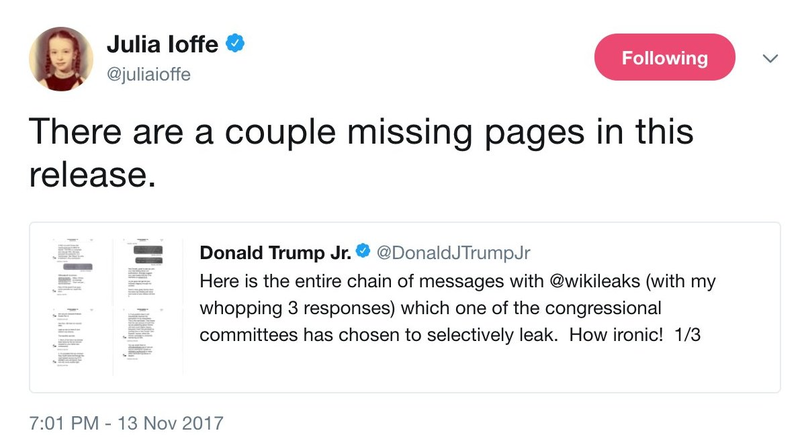 But then I read in The Guardian’s version of this story that Ioffe had actually tweeted to Don Jr. erroneously accusing him of excluding “a couple of missing pages” from his three-part release of his DMs with WikiLeaks. Ioffe eventually deleted the tweet, after it had been seen and reported on by many people, and clarified her error. “My bad,” she says. Cute. What Ioffe’s tweets tell us is that she had full copies of the DMs, since she knew that there were more pages missing from the single tweet by Don Jr. that she had read. The deceitful omission that is the subject of this article was clarified in the first Don Jr. tweet she replied to. She read it, she analyzed it enough to figure out what was missing, but she said nothing about the fact that there were a lot more words in the sentence that she selectively edited out to convey the exact opposite of its meaning. I’m no detective, but it sure looks like this was a willful omission on Ioffe’s part made deliberately with the intention of damaging WikiLeaks’ reputation. I have been attempting to contact Ioffe, whose other work for the Atlantic includes such titles as “The History of Russian Involvement in America’s Race Wars” and “The Russians Are Glad Trump Detests the New Sanctions”; I will update this article if she has anything she’d like to say. 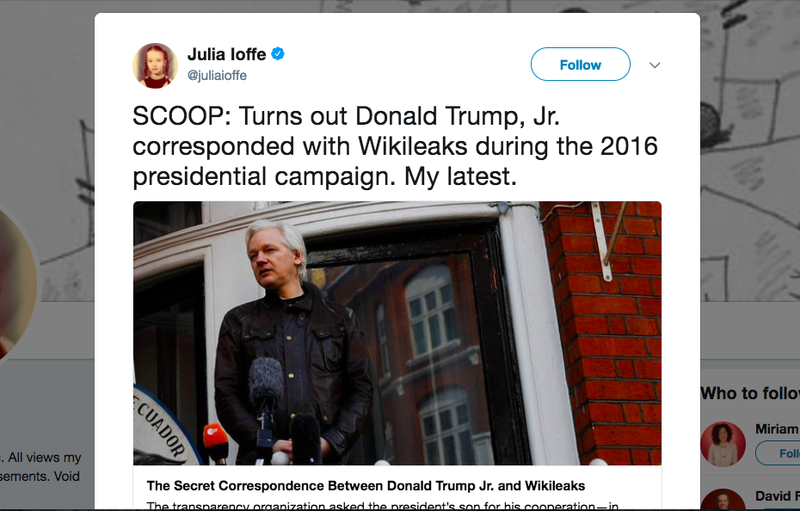 Also worth noting is Ioffe’s omission of the fact that we’ve known since July that WikiLeaks had contacted Donald Trump Jr., as well as the fact that Julian Assange’s internet was cut at the time some of the Don Jr. messages were sent, meaning they may have been sent by someone else with access to the WikiLeaks account. As happens every single time these pro-establishment manipulations take place, the rest of the mainstream media is picking up the Atlantic’s deceitful omission and running with it as fact. GQ ran with it quoting the selectively edited text. ABC and CBS both ran with the same fake quote even after including Don Jr.’s tweets which make it clear that text was omitted. The Guardian went so far as to use the Atlantic’s selectively edited quote, and then publish an update saying that Julian Assange had “suggested that the Atlantic had selectively edited the messages” without updating the original selectively edited quote or publishing the omitted text. What percentage of Guardian readers do you think went and read the private messages published by Don Jr. for themselves and learned that they’d been manipulated? One percent? Half of one percent? Why would they go read the published DMs if their trusted Guardian was presenting itself as conveying the full truth? The Atlantic’s senior editor is neocon David Frum, who is credited with coining the phrase “axis of evil” used in George W Bush’s jingoistic schtick, and its editor-in-chief is the neocon Jeffrey Goldberg. Its corporate owner, Atlantic Media Company, is chaired by New America’s David G. Bradley. New America is a DC think tank whose team includes representatives from Northrop Grumman and Raytheon along with big name media and corporate giants like CNN and Walmart, and whose top donors include Bill Gates, Google’s Eric Schmidt, and the US State Department. So this immoral manipulation is not exactly surprising. These are virulently pro-establishment people. Every time. This happens literally every single time there’s a new “bombshell” report on the Russiagate phenomenon, without exception. Twitter explodes, I’m bombarded with social media notifications telling me “HAHAHA I BET YOU FEEL LIKE AN IDIOT NOW”, then it turns out to be a basically innocuous revelation dishonestly blown up into something explosive by liars and manipulators in the establishment media. It’s fueled entirely by Trump derangement syndrome, not by facts. And people ask why I’m skeptical of the establishment Russia narrative. I’m skeptical because we’re being lied to every single step of the way by the news media who claim to be helping the public discover the truth. Trump lies because he’s a corrupt billionaire who knows he can get away with it, but that doesn’t make him a Russian agent. The media lies because they’re bolstering the stranglehold of America’s unelected power establishment, and that makes them traitors to our species. I stand with WikiLeaks. They’re doing more than anyone else to shake loose the nuts and bolts of the omnicidal death machine that is driving our species toward extinction, and that’s why that same death machine pours so much energy into tarnishing their reputation so their leaks will be dismissed. Even my fellow leftists have been largely won over by the ongoing psyop to paint Assange as an evil Nazi, and I simply have no respect for that perspective. When there’s such a massive, concerted effort by America’s unelected government to sabotage someone’s reputation, your belief that they’re bad is probably a deliberate and artificial construct. The mainstream media is not your friend, America. It’s time to send them the way of the dinosaur before they do the same to us. UPDATE 5 PM EST 11/14/17: Surprise, surprise, here’s Chris Hayes on MSNBC regurgitating Ioffe’s selectively edited quote on MSNBC. There will be others. There is no way to undo the damage that was done by this lie. At the end of the clip Ioffe actually asserts that her story confirms Russia-WikiLeaks collusion, without at any time acknowledging that the only thing in the story that makes it look that way is her selectively-edited quote. If Russiagate was valid, the people selling it to us wouldn’t have to lie about it every single step of the way.